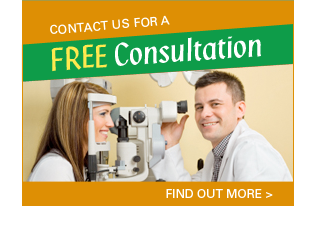 Several hundred thousands of people suffering from eye vision challenges and who are astigmatic, farsighted, or nearsighted are enabled by LASIK Vision Correction which eliminates or reduces dependency of these people on contact lenses or glasses. The excimer laser is used to in a LASIK procedure to reshape the curvature of cornea. LASIK procedure employs a cool beam of excimer laser light. Cornea's microscopic layer is folded back in a LASIK procedure using an excimer laser in order to reshape the cornea surface. The LASIK procedure also involves repositioning of the flap as a layer for protection. 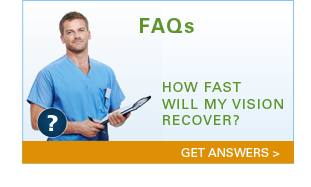 Once a LASIK procedure has been performed, generally a clear vision is restored early in the next morning. Therefore, in most of the cases patients are able to return and resume their work as early as next day. However, some patients may face a minor visual fluctuation especially during initial days up to two weeks following LASIK. Furthermore, during the recovery window some patients may also feel some dryness or similar sensation in the eye. During every single LASIK procedure anaesthesia is administered using eye drops to numb the eyes. However, the procedure does not require needles or stitches of any kind. Almost every patient discovers and enjoys a clear and improved vision soon after a trained doctor has performed the stunts, which takes merely 15 to 20 minutes if performed on both eyes. Tissue’s extremely thin layer, about 50 microns, separates the cornea surface, in LASEK a LASIK variant, and repositioned following cornea’s laser reshaping process. Both the procedures use same cool excimer later beams. However, LASEK is more suitable in case of relatively thin cornea unsuitable for LASIK. With slight discomfort during first 48 hours, the recovery window typically lasts from 3 days up to 7 days. CK, an approved MONOVISION or BLENDED VISION reading glasses (presbyopia) treatment, uses radio waves to reshape the cornea without any cuts or discomfort and requires merely 5 minutes or less with anaesthesia eye-drops. Moreover, the minor irritation also disappears within 24 to 48 hours. People requiring unique correction are treated with CUSTOM LASIK, which captures a "fingerprint" of the eye with a 25 times more precise Bausch & Lomb's Zyoptix or VISX Wavescan/Star S4 laser system. The Wavefront technology is capable of capturing specific vision imperfections over and above nearsightedness, farsightedness, and astigmatism. An individualized treatment using a CustomVue procedure is thus available based on the data to achieve much better vision compared to glasses or contacts. 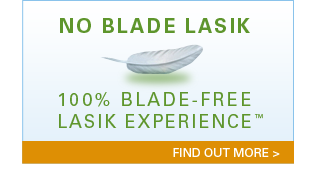 NO-BLADE LASIK – With unique INTRALASIK software INTRALASIK, an all-laser fully computerized technology does not require a surgical blade for creation of a corneal flap. The computer software provides utmost precision and comfort in aligning the laser pulses to create LASIK flap in a plane, thereby reducing patient’s anxiety, providing an unparalleled safety, accuracy, and ruling out blade-related complications. 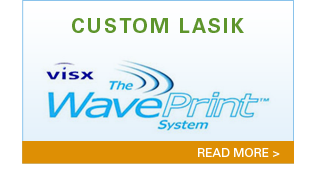 The CUSTOM-INTRALASIK creates a flap using INTRALASIK technology, reshapes the cornea utilizing innovative Custom Wavefront technology, and thus it delivers accuracy, safety, in addition to delivering superior quality of vision.